Travel back to the dark and dismal days of the Victorian era when Jack the Ripper roamed the streets with this VR experience! County Hall, Westminster Bridge Road, London SE1 7PB. Departure Point: Traders Gate Souvenir Shop, 35 Tower Hill, London, EC3. Please arrive 15 minutes prior to departure time (5.45pm). Delve into the world of Victorian London at its most grisly during this fascinatingly frightful Jack the Ripper Walking Tour. A nationwide manhunt began after a man found a gruesomely murdered prostitute on the streets of Whitechapel in 1888 – and more killings followed! 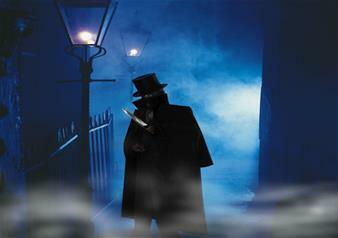 Ripperologists and amateur sleuths are still trying to work out the identity of the man they called Jack the Ripper! The tour will finish at approximately 7.30pm near Liverpool Street Station. Venture deep into the midst of the terrifying London Dungeon darkness as you travel back through the ages that London is known for. Re-visit the blood, gore and betrayal at this immersive experience that will test your senses to the limit! Hear the sounds of old London city, the smells and the feel with special effects and role-play and actors bringing to the Dungeon story-telling to life. During your 90 minute adventure, you’ll come face to face with the infamous Guy Fawkes and his notorious plan to blow up the Houses of Parliament before moving onto the panic of the Great Fire of London. But have your wits about you as you wander the streets of rat-infested London as you’ll be stopping off at Sweeney Todd’s barber shop and those pies definitely aren’t full of pork! Once you survive this fateful encounter, you’ll follow in the footsteps of one of the world’s most prolific serial killers – Jack the Ripper – and hear the horrifying end that his victims came to. The Dungeon is not recommended for those of nervous disposition or very young children. This ticket is for 'Priority Access' admission. There may be a queue at the 'Priority Access' entrance during busy periods. Please note that the busiest period at the London Dungeon is between 11am and 3pm, so it is advisable to visit at a different time.